Education Qualification : Constable GD/Band- Passed 8th Class Exam from any recognized board and Knowledge of Hindi Devnagri Lipi and Rajasthani Culture. Constable Driver- Passed 8th Class Exam from any recognized board and Knowledge of Hindi Devnagri Lipi and Rajasthani Culture with a Valid 1 year Old HMV/LMV Driving Licence. 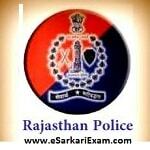 Eligible Candidates can Submit Application at the Official Website of Rajasthan Police latest by 10th August 2018. Applicants First Logon to Rajasthan Police Official Website. Click on MBC Banswara Constable Recruitment 2018 Advertisement Link. Apply Through Rajasthan Police Constable Recruitment 2018 Link. Click on Login Link if already Registered. Register on Rajasthan Single Sign on Portal. After Registering SSO Portal Click Recruitment Portal Link. Click on Ongoing Recruitment at Respective Link. Pay Application Fee, Upload Scan Photograph and Signature. Take a Print out of Online Application for Future Reference.